John Rich: "Your voice is pure, pure, pure, great country music." 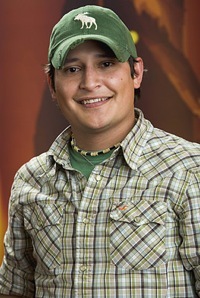 The sixth season of Nashville Star (Mondays at 8pm on NBC) features Gabe Garcia of Lytle, Texas as one of the contestants. Nashville Star is a country music single-elimination competition similar to American Idol and ran on the USA Network from 2003-2007 before moving to NBC this year. Gabe has already survived two weeks of elimination, with the judges raving about his voice. Judge John Rich said, "your voice is pure, pure, pure, great country music right there." Hispanic country music singers and Hispanic country music audiences have been the El Dorado of the country music business in recent years, with the great reward never quite materializing. Nashville Star has previously featured two Hispanic contestants (John Arthur Martinez finished second in Season 1 and Melanie Torres finished seventh in Season 4), and CMT's Gone Country show awarded Julio Iglesias Jr. its top spot earlier this year. In 2007, the corporate side of the business commissioned a report on the potential of the Hispanic market (see here for more details on all of the above). Gabe is proud of his roots and wants to inspire other Hispanics to pursue a career in country music, just as Rick Trevino inspired him. The ultimate Tex-Mex cowboy, Gabe left San Antonio and his job of 10 years after his father passed away last October. He's now following his dream and he's not turning back. With his family's support, Gabe wants to be the next "Nashville Star" with his mother cheering him on from the audience. Truth be told. He's the best. He's down to earth and he just loves everybody. He's a good friend of mine and my favorite artist from South Texas as well. Rock on buddy. Gabe Garcia sings with a maturity and sound far beyond his 28 years. As a '98 graduate of Lytle High School, it was evident Gabe and his aspiring voice would touch the hearts of country music fans throughout south and central Texas. Raised in Lytle by Mr. and Mrs. Juan Garcia Sr. and brother Juan Jr., Gabriel was influenced early on by artists such as Merle Haggard, Rick Trevino, and George Strait. He has opened for various well known country artists such as Blackhawk, Sherrie Austin, Ray Price, Kitty Wells, Richochet, and even performed for George W. Bush. Among the many of his local and state honors, Gabe and his band recently won the South Texas State Championship in the Colgate Country Showdown. In 1997 Gabe won the 1997 Y100 Battle of the Bands and was the featured performer two consecutive years at the National FFA Convention. According to Wiley Alexander, Gabe is a personable and super-talented icon who pays great tribute to country music.